Who is at fault in this picture? You may think this is an impossible question to answer, but it is one insurance companies are met with on a regular basis. Neither party will accept responsibility, so both are punished by the insurer. Dash cam evidence is essential when proving your innocence to the insurance company. It is no secret that driving is becoming an increasingly dangerous activity, whether it’s due to fraudulent “crash for cash” shams, insurance scammers, greedy traffic wardens, or simply a lack of competent drivers. Fitting a dash cam to your vehicle will protect you from taking the blame in a collision, and could save you a hefty cost if you’re targeted by one of these scams. As well as this, fitting a dash cam to your vehicle could help out other drivers if you happen to be a witness, and some models will protect your vehicle while parked. Thanks to advances in technology and online shopping, protecting your car may cost less than you think. In this article we’ve put together a list of our top 5 best dash cams in 2017, all within a tight budget. If you do have the money to put towards a more expensive model, it will certainly make a big difference in terms of video quality, but you don’t need to splash out on a pricey camera for a little bit of protection. 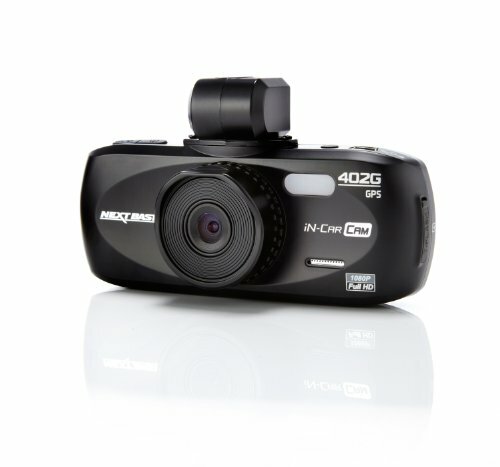 As a final note, we recommend staying clear of very cheap dash cams, as these can’t be relied on for protection. There’s no point buying a dash cam if it fails at the important moment, or provides video quality too poor to use as evidence. The list below features the best 5 dash cams to buy in 2017 (in our opinion), and is based heavily on personal experience with each model. All of the following dash cameras can be bought from the Amazon UK store, and you can find the links below. Every dash cam requires a Micro SD card to store the recorded footage. At the end of this article we’ve included a list of cards to consider purchasing, and well as which ones to avoid. 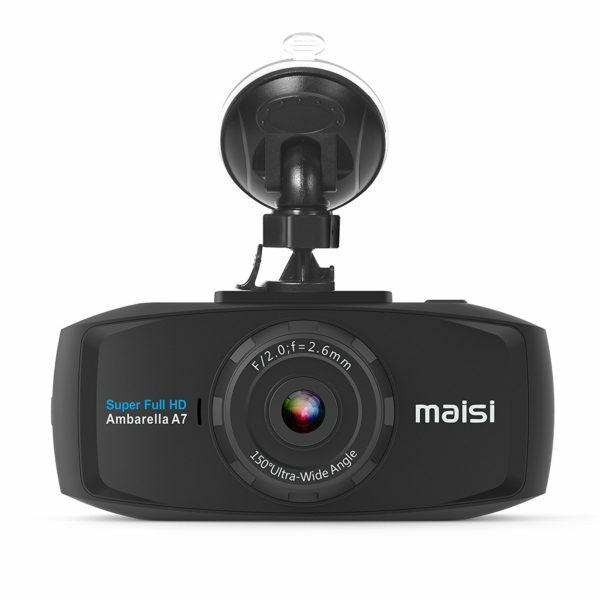 Labelled on Amazon as the Maisi Smart Car Recorder, this dash cam provides good footage in low light conditions, great video quality during the day, and has unbeatable customer support. This model is able to provide fantastic value for money with a maximum resolution of 1296P (better than full HD), a GPS dongle providing speed and location data, and two different mount types, giving you the choice of temporary or permanent installation. The large, high quality screen can be used to play back recorded footage, access and change settings in the intuitive menus, or watch a live video feed so you can make adjustments before you go. The 170° wide angle provides a good view of the road and surrounding areas. As one of the best selling car cameras on Amazon UK, this dash cam lives up to it’s near 5 star rating. At the time of writing Maisi give you 12 months warranty, and have a responsive customer support team. 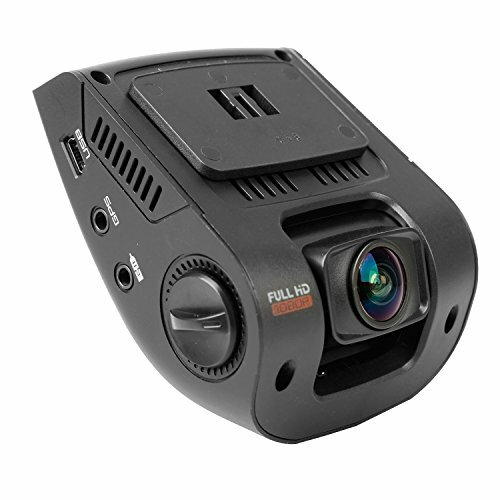 This camera has all of the common features; Loop Recording, a date/time stamp, a built in G-Sensor, as well as some advanced features including; GPS tracking, a Lane Departure Warning System, and Motion Detection. These will be explained below. Video Resolution – Although 1296p resolution sounds great, you are going to see sharp images such as those take from professional cameras. Recording high quality footage is very expensive, and the current technology doesn’t allow budget dash cams this opportunity yet. 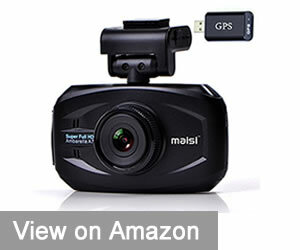 However, the Maisi Smart provides significantly better video quality than other dashboard cameras in this price range. As a final note on this, you might want to reduce the resolution to 1080p, to stop the SD card filling up quickly. GPS – This is activated by plugging in the USB dongle (included) into the mount. GPS for dash cams works in a different way to sat navs. Instead of providing directions, the GPS tracks your speed and location, and will allow you to playback your route on google maps, using an external program (we had some issues with the program included, so we recommend using Registrator Viewer). Motion Detection – This feature can be turned on in the menu, and allows the camera to automatically begin recording when it senses movement. Unfortunately you will need to hard wire the camera to your vehicle to use this feature to it’s full potential, as battery life isn’t particularly long. Make sure to turn this feature off when using the dash cam normally, as it will cause recording to start and stop at seemingly random times. In conclusion, the Maisi Smart dash cam gives you great video quality with a wide range of advanced features. From personal experience, their customer support team has been both responsive and helpful. Unlike Full HD dash cams, the Maisi Smart requires a faster micro SD card for the higher resolutions. You can find more information at the end of this article. The Toguard Mini Full HD is the cheapest dash cam we are going to recommend. Any camera with a lower price tag is a risky bet, and we wouldn’t advise taking risky bets when protecting yourself. Currently, this model is the most popular on the market, likely a result of the low price. Despite the fairly poor video quality, the Toguard has a handful of useful features you’d find in a reliable dash cam, and includes a free 16GB Micro SD Card (at the time of writing) when purchased here. Even with the small size (it’s only 2.5 inches wide), the Toguard Mini remains easy to use, with six fairly large buttons on the back and an easy to set up suction mount. For those searching for their first dash cam, or something to satisfy an insurance deal, the Toguard Mini HD is a good option. The low quality video may put you off, but you’re unlikely to find anything better for this price. You get the usual features; Loop Recording, G-Sensor, and a Time Stamp. There is also a motion detection feature, which proved to be surprisingly accurate in our tests. As the battery life only lasts around an hour from full charge, you’ll need to hardwire the dashcam to make the most from this feature. The Toguard instructions are poorly translated from Chinese, but this shouldn’t cause any issues as set up is fairly easy and intuitive. If you have any problems, please send an email or leave a comment, and we’ll offer any help we can. The box contains a nice and sturdy suction mount, allowing you to easily set up and remove the dash cam in different vehicles. We recommend this dash cam if you; prioritize price over quality, are buying your first dash cam, or if you need a camera for work or insurance purposes. 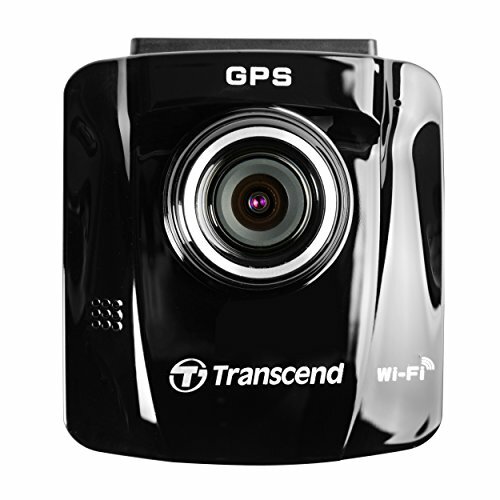 We can’t recommend this camera if most of your driving is done during the night, as low light quality is poor. Finally, if you struggle to read small writing, the Toguard is not for you. Even though it’s labelled as 1080P Full HD, the Toguard’s footage is choppy and blurry (max frame rate is only 24fps). Night time recording is very poor, so avoid this camera if most of your driving is at night. Footage during the day is certainly good enough to rely on as evidence (Read our full guide for video). Props to the manufacturer for including a free micro SD card (at the time of writing). 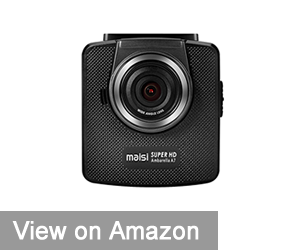 The Maisi Ultra HD dash cam combines high video quality (greater than 1080p) with an exceptionally wide field of view. This wide angle lens allows the camera to easily pick up all lanes of the motorway, and lets you see overtaking cars earlier than most dash cams. For these reasons we highly recommend this dash cam for motorway drivers, as being hit from the side is one of the most common incidents. 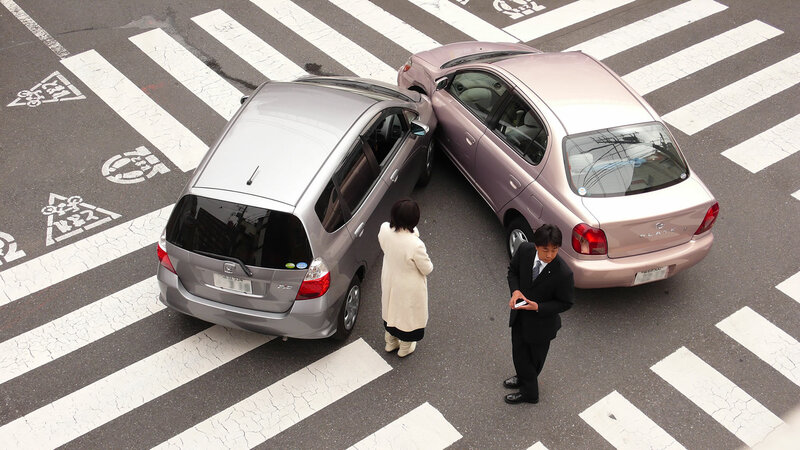 This usually occurs when a car doesn’t see you while changing lanes, or when another vehicle tries to fill a space that isn’t big enough. The quality during the day is good enough to pick up more precise details such as number plates, and although this precision is lost at night (all dash cams suffer in the dark), the footage would be good enough to rely on if an accident was to occur. The Maisi Ultra HD should be a top pick if you’re looking for an easy to use, and great value for money dash cam. From our own experiences with Maisi, their customer support team is second to none. We are particularly impressed by the design of this car cam. The buttons are firm and easy to press, and the menus are easy to navigate. When turned on, the power switch covers over the Micro SD card slot. This stops you from removing the SD card while switched on, as this can cause damage. The only slight problem is the mount, which can require a lot of force to attach. Once this is secured, the suction mound makes the Ultra HD easy to install. Note: this model is similar to the Maisi M85 In Car Dash Cam. Both the design and specifications are comparable, and although we’ve yet to test out the In-Car camcorder, we recommend having a look. The usual features are included; Loop Recording, G-Sensor, and a Time Stamp setting. The Maisi Ultra HD has a Lane Departure Warning System, which alerts you when drifting out of lane.There is also a motion detection feature, but we could only get this working when the source of power was removed. For this reason it was only useful for short stops, as hardwiring didn’t allow use to use this feature. Resolution – Although 1296P sounds like a great resolution, you won’t see sharp images such as those taken with professional cameras. Capturing top quality footage can be very expensive, and the technology isn’t there yet to allow budget dash cams this opportunity. We also recommend reducing the resolution to 1080P, to allow more videos to be saved to the SD card. If you prefer a smoother video, 720P at 60fps is also an option. In conclusion, the Maisi Ultra HD provides secure protection, particularly on motorway journeys. We are happy to recommend this product based on our own experience. If you are experiencing any problems with the dash cam, contact their customer support team and they will provide assistance. Unlike most dash cams, the Maisi Ultra HD will need a faster micro SD card for the higher resolutions. We have provided more detail at the end of this article. The Vantrue N2 is the most costly dash cam on this list, due to the high quality dual camera system. 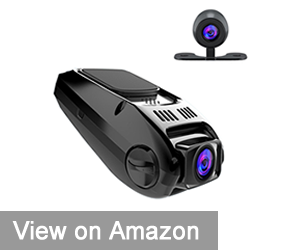 This model can record both inside and outside the vehicle, a must have dashcam for taxi or uber drivers. The front camera’s 1080p footage is great, while the rear facing 720p camera is good during the day, but will suffer in the dark. 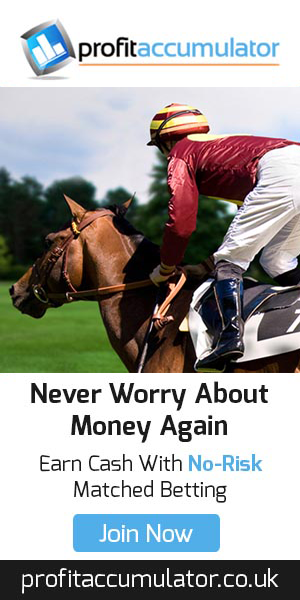 If this is going to be a problem, you may have to up your budget and opt for a camera with infrared capabilities. While in dual cam mode, the front camera records at 1440 x 1080. The Vantrue dash cam gives you all the standard features; a built in G Sensor, Loop Recording, etc, as well as 2 different parking modes. The first of these utilizes motion detection, and starts the camera recording if motion is detected near your car. The second is triggered by Time Lapse, and will keep taking photos at a set time interval, then edit them together into a video clip. Due to the short battery life, you’ll need to hard wire the dash cam for longer stops. Vantrue has become an established company in the dash cam market, which can be seen in their high product ratings. The N2 is no different, currently boasting a 4.4 star rating on Amazon. You also receive a 30 day money back guarantee, as well as a 18 months free replacement (click here to visit Amazon and check this is still being offered). Setup is simple, and the Vantrue instruction manual is informative and easy to understand. 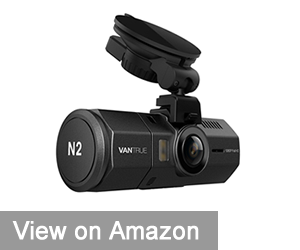 The Vantrue N2 is a great choice for anyone needing to record both inside and outside of the car, particularly during the day. If you only require a single camera facing inside the car, you can purchase a cheaper dash cam and turn it around (not all models can do this). If you are interested in this model, wait for it to go under £110 as it goes on sale often. The Apeman also has a dual camera system. However, unlike the Vantrue N2, the Apeman’s second camera can be used to record behind your vehicle. This may seem like an obvious decision considering how common it is to be hit from behind, but the majority of dash cams on the market only offer protection for the front of your car. 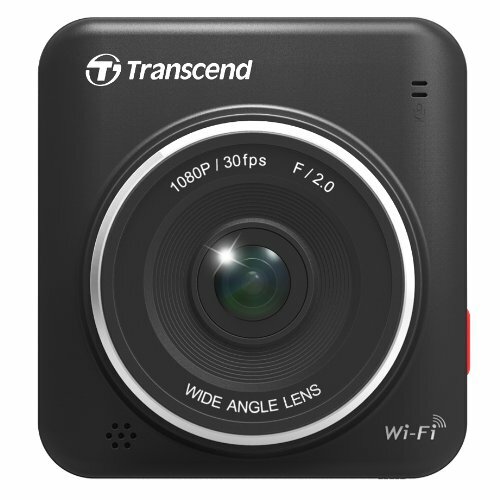 The quality of the front facing 1080p 30fps camera is impressive for the price you pay, and even manages to record sufficient footage during the night. Even though the rear camera only gives you 480p footage, it is still fit for purpose, showing this dash cam’s fantastic value for money. The Apeman dash cam might have a cheap plastic feel to it, but this is expected from a budget camera, particularly one offering so much. Wiring up the camera might be a bit fiddly and time consuming depending on how much wire you want to hide. A power cable needs to be taken from the cigarette lighter socket to the front camera, and another long wire goes from the front camera to the rear. The Apeman in car dash cam has a built in G Sensor to automatically save important footage, and uses loop recording to allow more space on the Micro SD card (currently not included with the purchase). There is also space for a GPS dongle (to track speed and location data), but this must be purchased separately. Motion detection is another feature of this camera, but as there is no internal battery, you’ll need to hardwire the camera to your vehicle if you want to protect your vehicle while parked. In conclusion, this camera is a good choice for those looking for front and rear protection. Be warned though, the rear camera quality is fairly poor, and may not pick up number plates. Nextbase 101 – Nextbase are one of the more well known dash cam brands, and as a result can charge higher prices. Although this particular model only provides 720p with a 120 degree viewing angle, it is a reliable budget camera. Toguard Stealth – Currently at 4.8 stars on Amazon UK, this Toguard model is quickly becoming a best seller. Giving you a discreet design with a 170 degree lens, 1080P resolution and built in WiFi for file transfers, this dash cam is worth taking a look at. Oldshark FHD Dash Cam – Although we’ve yet to test this dash cam, it currently has a 4.7 star rating with 150+ reviews on Amazon UK. With 1080p resolution and a free 32GB micro SD card included, it’s another one worth considering. 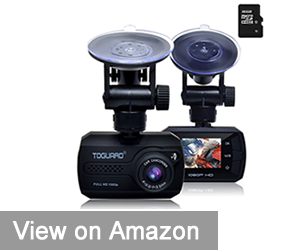 Toguard Dual Dash Cam – Similarly to the Apeman, this Toguard model uses 1080p front and 480p rear facing cameras for a very similar price. There is little to choose between the two, so make sure to consider both if you’re looking for front and rear protection. Which Micro SD Card Should You buy? The majority of dash cams use Loop Recording, which records footage in loops of specified lengths. While these loops are being recorded, the dash cam will mark each loop as important or unimportant. If the driver manually protects the loop by pressing a button, or if the G Sensor detects a sudden change in acceleration, that loop will be marked as important. When the Micro SD card becomes full, the dash cam will overwrite the earliest footage marked as important, to make way for new footage. Using this method, one SD card is able to provide infinite storage (as long as there are no important loops). This doesn’t come without it’s flaws however, as Micro SD cards are slightly damaged each time files are overwritten. Certain cards are created to last longer in dash cams or other surveillance systems. Simply put, there are two common types of micro SD storage, TLC and MLC. TLC cards are cheaper and less reliable than MLC, and usually experience failure after overwriting around 500 times. Most of the SD cards you see on the market are TLC cards. MLC is more reliable, giving you around 2000 to 3000 overwrites before failing. The main downside is, they are more expensive. Although the choice is yours, you will likely find TLC to be sufficient for use. If you want to record at 1080p Full HD, you’ll need a minimum Class 10 Micro SD card. Different dash cams allow various sizes, but your safest bet is with a 16GB or 32GB card. If you’re buying a camera with superior resolution (above 1080p) such as Maisi dash cams listed above, we recommend a Class 10 U3 card (SanDisk Extreme), as these cards have a minimum write speed of 30mb/s. Recently the internet has become flooded with fake micro SD cards. These are usually slower than described, have far less storage than you expect, or don’t work at all. When buying an SD card from Amazon, it is important to see that the item is both sold and dispatched by either Amazon or the manufacturer. If you purchase from a different seller you are likely to receive a counterfeit product. Unfortunately, even with these precautions there is still a chance of receiving a faulty item. Don’t worry though, as Amazon will always replace or refund any counterfeit products. Make sure to test out the SD card when it arrives, and get in touch with Amazon if you notice any problems. You might also want to reporting the seller so other buyers aren’t caught out. Although Sandisk is a reputable manufacturer who offer some fantastic products, the Sandisk Ultra Micro SD card has been known to have compatibility issues with a wide range of dash cams. For this reason we recommend you pick an alternative. 1. Sandisk Extreme – Class 10 U3, great for 1296P resolution of the Maisi dash cams. For 1080p dash cams, choose another card. 2. Transcend High Endurance – Highly recommended if you’re willing to spend a bit more on a more reliable card. MLC micro SD card designed specifically for dash cams and security systems. Class 10 speed, good enough for 1080p. 3. Kingston Micro SD – Be wary as Kingston cards are often fake (we stopped buying these due to the amount of counterfeit cards) . Usually the cheapest micro SD cards. At Class 10, they are suitable for 1080p. 4. Samsung Evo – Similar to the Kingston, but tend to be more reliable in our experience. Class 10 speed, fast enough for 1080p. 5. Lexar 300x – We’ve never used this card before, but as a Class 10 card it’s fast enough for 1080p.